America’s education system is based on the assumption that barring illness or an extraordinary event, students are in class every weekday. So strong is this assumption that it is not even measured. Indeed, it is the rare state education department, school district or principal that can tell you how many students have missed 10 percent or more of the school year or in the previous year missed a month or more school − two common definitions of chronic absence. Because it is not measured, chronic absenteeism is not acted upon. Like bacteria in a hospital, chronic absenteeism can wreak havoc long before it is discovered. If the evidence in this report is borne out through more systematic data collection and analysis, that havoc may have already undermined school reform efforts of the past quarter century and negated the positive impact of future efforts. Students need to attend school daily to succeed. The good news of this report is that being in school leads to succeeding in school. Achievement, especially in math, is very sensitive to attendance, and absence of even two weeks during one school year matters. Attendance also strongly affects standardized test scores and graduation and dropout rates. Educators and policymakers cannot truly understand achievement gaps or efforts to close them without considering chronic absenteeism. Chronic absenteeism is not the same as truancy or average daily attendance – the attendance rate schools use for state report cards and federal accountability. Chronic absenteeism means missing 10 percent of a school year for any reason. A school can have average daily attendance of 90 percent and still have 40 percent of its students chronically absent, because on different days, different students make up that 90 percent. Data from only six states address this issue: Georgia, Florida, Maryland, Nebraska, Oregon and Rhode Island. How these states measure chronic absenteeism, however, differs by number of days and by whether or not data include transfer students. Such limited data produce only an educated guess at the size of the nation’s attendance challenge: A national rate of 10 percent chronic absenteeism seems conservative and it could be as high as 15 percent, meaning that 5 million to 7.5 million students are chronically absent. Looking at this more closely sharpens the impact. In Maryland, for instance, there are 58 elementary schools that have 50 or more chronically absent students; that is, two classrooms of students who miss more than a month of school a year. In a high school, where chronic absenteeism is higher, there are 61 schools where 250 or more students are missing a month or more of school. The six states reported chronic absentee rates from 6 percent to 23 percent, with high poverty urban areas reporting up to one-third of students chronically absent. In poor rural areas, one in four students can miss at least a month’s worth of school. The negative impact chronic absenteeism has on school success is increased because students who are chronically absent in one year are often chronically absent in multiple years. As a result, particularly in high poverty areas, significant numbers of students are missing amounts of school that are staggering: on the order of six months to over a year, over a five year period. Chronic absenteeism is most prevalent among low-income students. Gender and ethnic background do not appear to play a role in this. The youngest and the oldest students tend to have the highest rates of chronic absenteeism, with students attending most regularly in third through fifth grades. Chronic absenteeism begins to rise in middle school and continues climbing through 12th grade, with seniors often having the highest rate of all. The data also suggest that chronic absenteeism is concentrated in relatively few schools, with 15 percent of schools in Florida, for example, accounting for at least half of all chronically absent students. In a nationally representative data set, chronic absence in kindergarten was associated with lower academic performance in first grade. The impact is twice as great for students from low-income families. A Baltimore study found a strong relationship between sixth-grade attendance and the percentage of students graduating on time or within a year of their expected high school graduation. Chronic absenteeism increases achievement gaps at the elementary, middle, and high school levels. Because students reared in poverty benefit the most from being in school, one of the most effective strategies for providing pathways out of poverty is to do what it takes to get these students in school every day. This alone, even without improvements in the American education system, will drive up achievement, high school graduation, and college attainment rates. Students who cannot attend school due to illness, family responsibilities, housing instability, the need to work or involvement with the juvenile justice system. Students who will not attend school to avoid bullying, unsafe conditions, harassment and embarrassment. Students who do not attend school because they, or their parents, do not see the value in being there, they have something else they would rather do, or nothing stops them from skipping school. Despite being pervasive, though overlooked, chronic absenteeism is raising flags in some schools and communities. 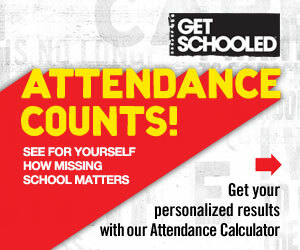 This awareness is leading to attendance campaigns that are so vigorous and comprehensive they pay off quickly. Examples of progress nationally and at state, district, and school levels give hope to the challenge of chronic absenteeism, besides being models for others. In addition to these efforts, both the federal government, state departments of education, and school districts need to regularly measure and report the rates of chronic absenteeism and regular attendance (missing five days or less a year) for every school. State and district policies need to encourage every student to attend school every day and support school districts, schools, non-profits, communities, and parents in using evidence-based strategies to act upon these data to propel all students to attend school daily. Mayors and governors have critical roles to play in leading inter-agency task forces that bring health, housing, justice, transportation, and education agencies together to organize coordinated efforts to help every student attend every day. Download the presentation tool, available here as a PowerPoint show.